You may have been startled recently, as have others, by the intense energies that have, since the beginning of January, been pouring into Earth. Another season of renewal and Light upgrades for humankind and for Gaia has arrived. We can anticipate getting Light downloads and DNA upgrades till just after the Fall Equinox 2018. Right now, Earth and all her beings are ramping up to the Spring Equinoctial Energies; the crescendo will most likely take place on or around 20 March 2018, which is the date of the Spring Equinox UTC, CDT and PST. What life is ending? What is it that I want to let go, and eliminate from my life experience? What new things do I want to bring into my life experience? What upgrades would I like to experience on the physical plane? What illnesses would I like to be fully healed? What are the emotions that crimp my style? Shall I discard them? What emotions would I like to cultivate? How can I bring those emotions into my daily life? What old beliefs would I like to let go? What mind sets are crippling my relationships with other people? What news reports am I reading or viewing that are negative in flavor, and that may jaundice my view of this beautiful planet? What new beliefs would I like to try out? Beliefs that will help me embrace the new, fully healed physical person? For the New is tumbling in to the Earth planes, by the bucketful, streaming down in gentle Spring showers, hailing down in tempestuous Spring rainstorms, through solar winds, through protonfall and through CMEs, willy nilly and no matter what! The New is knocking on the front door of every being on Earth. Be that door locked, it will peek in our bedroom window! Be that shade drawn, it will find us on the way to work! Indeed, should we hide in the cellar, it will come up the the roots in the Earth, ever so gently, and renew us. Music Link: “Thoughts of the Past – Shahrdad Rohani – شهرداد روحانی,” by A. M. Goudarzi, 21 March 2014, https://www.youtube.com/watch?annotation_id=annotation_308137117&feature=iv&src_vid=7rQVenRikI0&v=4tdMsFcEKtQ ..
I’m reminded of how the people of ancient times used to dance in the Spring rains, and celebrate their presence on Earth. Dancing is really where it’s at, isn’t it? Figuring out Who our partner really is, and in the ecstasy of the moment, being at one with that One. Music Link: “Dance of Spring – Shahrdad Rohani,” by amsal79, 14 April 2011, https://www.youtube.com/watch?v=pMdJAXzKsPg .. I wish you all happiness and renewal in this Storm of Spring. May we all be nourished by the waters of New Life, and may humankind flourish on our beautiful ‘Blue Boat Home’! Link: “Peter Mayer’s Blue Boat Home,” by JD Stillwater, 7 January 2017, https://www.youtube.com/watch?v=WhsXl1_rEwI ..
Link: “Earth Song Sound NASA Recording,” by Clark Human, 10 September 2012, https://www.youtube.com/watch?v=LPj2geUxyhs ..
Link: “The Bouncing, Intense Energies! !,” by Lisa Gawlas, 19 February 2018, https://lisagawlas.wordpress.com/2018/02/19/the-bouncing-intense-energies/#like-21977 ..
Link: “‘The Team’ via Peggy Black: A Highly Calibrated Processor, posted by Paul Backes, 17 February 2018, http://goldenageofgaia.com/2018/02/17/the-team-via-peggy-black-a-highly-calibrated-processor/ ..
Link: “What you seek you already have!,” by John Smallman, in JohnSmallman’s Blog: Our Spiritual Destination, 16 February 2018, https://johnsmallman.wordpress.com/2018/02/16/what-you-seek-you-already-have/ .. This entry was posted in Advaita - nonduality - duality, Almanac: solstice - equinox - moon cycles, Earth - Gaia, Incoming light - grace - leveling up, Mysticism, Physical DNA – genetics and tagged advaita, almanac, blue boat home, CMEs, coronal mass ejections, dance of spring, DNA upgrades, earth song, Gaia, incoming light, Mysticism, New Earth, New Life, protonfall, renewal, solar winds, Spring Equinox 2018 on 20 February 2018 by Alice B. Clagett. I read in Space Weather, www.spaceweather.com, for 22 October 2014, that solar activity has been quite high. In one week, there were the following solar flares: 27 C-class, 8 M-class, and 2 X-class. 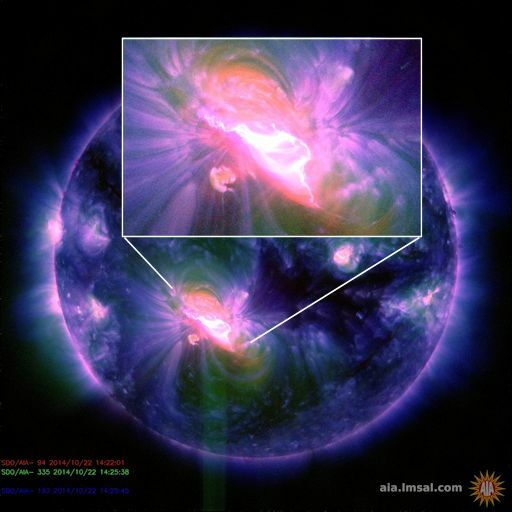 Image: Solar Flare, http://www.spaceweather.com/images2014/22oct14/x1_strip.jpg .. I guess this was the cause of all the mental hubbub this week: Ionization in Earth’s upper atmosphere due to solar flare activity. Link: “Chaotic Nodes and Dimensional Attunements,” from the Hathors through Tom Kenyon, http://tomkenyon.com/chaotic-nodes-and-dimensional-attunements ..
Link: “Cognitive and Emotional Challenges during Chaotic Nodes,” a Hathor Planetary Message through Tom Kenyon, http://tomkenyon.com/cognitive-and-emotional-challenges-during-chaotic-nodes ..
Link: “The Emergence of Multiple Chaotic Nodes,” a Hathor Planetary Message through Tom Kenyon, http://tomkenyon.com/the-emergence-of-multiple-chaotic-nodes ..
… causing mental turmoil as our etheric net tangles are jangled by upper atmosphere ionization, and, putatively, then cleared by incoming CMEs. I feel it’s the mental turmoil that is causing some of the instances of societal chaos mentioned by Tom Kenyon. Suspicious0bservers (2) has linked solar flare activity with weather and earthquakes, which are some of the other stressors mentioned by Tom Kenyon. societal chaos and earth chaos (weather, earthquakes) as secondary to the upgraded solar activity. clarification of all societal institutions to allow for honest, altruistic interpersonal dealings. We know that something has changed with the Sun because people are more and more beginning to be affected by solar flares and CMEs. But what, specifically, has changed is open to speculation. Some say that Earth’s passage into the ‘Photon Belt’ during the Shift in fall of 2012 is the cause of the change in the quality of light. Wikipedia describes the Photon Belt as a characteristic of the rings of the star Alcyone, in the Pleiades star cluster. “A photon is a boson–one of the elementary particles that carry the four forces of physics–in this case, the force that produces light, i.e., the electromagnetic force. To the extent that such a thing as a ‘photon belt’ is physically possible, it would require the gravitational pull of a black hole, with light rays being bent around the black hole near the event horizon, forming a photon sphere. Barring interaction with gravity or matter, photons otherwise always travel in straight lines. See also “Figure 10. 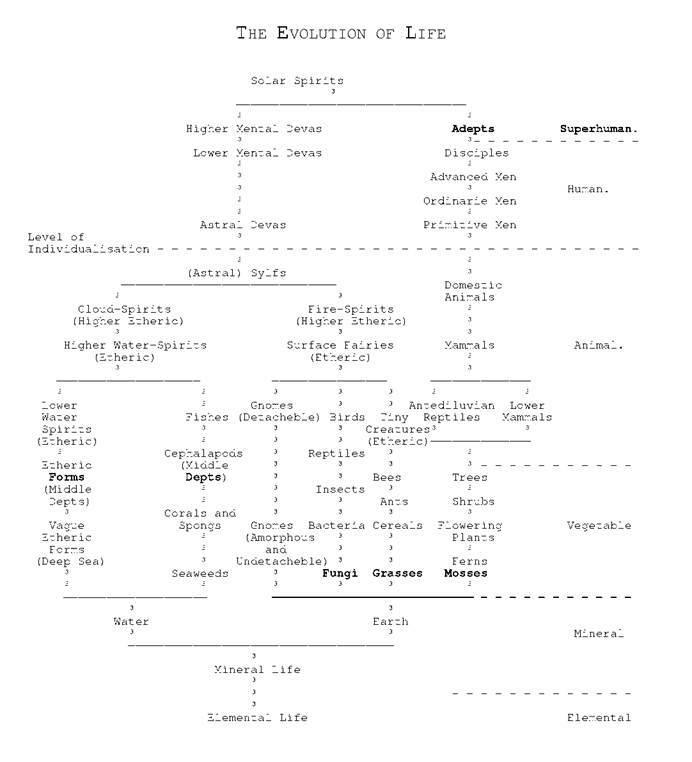 (Simplified) Polarities and Bonds Relative to Earth (only)” in that document. I think this is a link to the same figure … https://onedrive.live.com/?authkey=%21AKi7pUoxpFN1nqw&cid=25514A53D5563322&id=25514A53D5563322%217279&parId=25514A53D5563322%217247&o=OneUp ..
And also “Figure 7. Defining Dark Matter and Energy – Chemical Structure of the Earth Scheme – Part 2” in that document. I think this is a link to the same figure … https://www.researchgate.net/figure/203758419_fig5_Figure-7-Defining-Dark-Matter-and-Energy-Chemical-Structure-of-the-Earth-Scheme-Part ..
No doubt, a lot more is to be discovered on this topic. The motion of all the stars in our home galactic supercluster Laniakea is directed inward, toward the supercluster’s center of gravity, the “Great Attractor.” (5) We might think of gravity as love… the love of the center of our supercluster for all within the radius of its attraction. It could be that Earth is connected to Alcyone through lines of force in Laniakea. Wormholes, vortices, and Earth’s light grid are most likely features of the Laniakea force field. Since photons … the forces that produce light … are intelligent energy, capable of interdimensional travel (as shown by recent peer-reviewed scientific articles), they may be the means of conveyance of cosmic, or intergalactic, Divine intelligence. We might think of photons as the messengers, and of Light as the message. Divine intelligence may be a feature of the Great Attractor. (2) See Link: SuspiciousObservers … https://www.youtube.com/user/Suspicious0bservers/videos ..
(3) From Link: “Photon Belt,” in Wikipedia … https://en.wikipedia.org/wiki/Photon_belt … WP:CC BY-SA ..
(4) ViXra states it received an abbreviated version of this paper on 13 Nov 2009, and that it is this part of a work 30 years in the making; see Link: “New Cosmological Model for Matter, Energy, Sound, the Origin of the Universe and Gravity,” by Madonna-Megara Holloway … http://vixra.org/abs/0911.0036 ..
(5) See Link: “Laniakea Supercluster,” in Wikipedia … https://en.wikipedia.org/wiki/Laniakea_Supercluster … WP:CC BY-SA ..
(6) See Link: “Laniakea, Our Home Galactic Supercluster, and Clearing Our Axiatonal Lines,” by Alice B. Clagett … http://wp.me/p2Rkym-69s .. This entry was posted in 13 – Laniakea Supercluster (100000 galaxies), Anxiety - fear - panic attacks - fight or flight - cognitive dissonance - mental turmoil, Astrogeophysics - EMF - hologram, Axiatonal lines - diamond net of Indra - feeder lines of light, Chaos theory - butterfly effect, Grid of Light – crystal grid – Christ consciousness grid, Solar events - geostorms and tagged Alcyone, anxiety, astrogeophysics, axiatonal lines, Chaos theory - butterfly effect, CMEs, dark matter, gravity, Great Attractor, grid of light, Laniakea, mental chaos, Pleiades, solar flares, upper atmosphere ionization on 2 October 2017 by Alice B. Clagett. I’m sitting on a little hill overlooking Los Angeles, right around sunset. And I was thinking about the energetics of the last couple of days. You know, there have been various solar flares … I think two or three M-class flares, and one X-class flare … and an incoming coronal mass ejection (CME) glanced into the atmosphere of Earth as it came through. And so, there’s been a lot of commotion, celestially. And I thought I’d talk, for a minute, about how it has affected me personally. My cat [Lucy] and I are very sensitive to those kinds of solar activities. So I felt the effects of it. I felt a lot of clearing coming up. I felt a lot of clearing coming up. And of course, as it’s coming up, it doesn’t feel so good. It feels commotional. And last night I was sitting, meditating, and something really extraordinary happened for me. It was as if I had been bringing up samskaras, or auric imperfections. I could hear them clairaudiently. And I could feel them energetically. And I had been feeling them nonstop; sometimes I would wake up at night and I would feel strange energetic effects. And my mind would tell me one thing; something very dramatic. But by feeling the energy of the situation, I saw that my mind is a bit of an alarmist. You know? It comes up with the most horrible conclusions about things that are purely energetic changes in the body. … and my mind said to me: You’re dying! So then I felt myself energetically, and I could feel little batches of cells sort of jumping around, like they were dancing. Separate little batches: First one batch, maybe in my lower abdomen, and then something in my foot, and then something someplace else. And the mind puts its own interpretation on energetic things. But lots of times, the mind is completely wrong. You know? In this case, it was just, my energy was shifting, and it took a little trust to just understand that nothing bad was happening. To continue with my story: It was an incredible meditation. And I felt as if a process … a very complicated, way-beyond-me process … happened, where Light came in above me, and filled in the imperfections in my aura (what some people call Soul wounding). And so the Light was coming in, and it was filling in tiny bit by tiny bit; It was a masterpiece. And it was coming in, in different directions. It would hit something in my head, up here [points to right top of head], and then it would hit something in my left side, and then it moved to my high heart. And by the time that it was finished, at the end of the meditation, I felt completely different as a person. And fortunately, this effect has lasted all day long today. So I have nothing but wonderful things to say about this solar energy that comes in. Feels like maybe we’re dying; but actually, we’re kind of being reborn, or reworked, or refashioned, into something whole and happy and sane. So I’m wishing you the best through these solar flares. I hope your mind can see it the way your body can feel it. And I’m wishing you all the best. You all take care. This entry was posted in Astrogeophysics - EMF - hologram, Samskaras - karmic miasmic patterning - morphogenetic field distortions, Solar events - geostorms, Soul wounding - soul clearing - core star energy and tagged astrogeophysics, clearing the aura, CMEs, coronal mass ejections, ditching the drama, dying to the old, negspeak, samskaras, solar events, solar flares, soul wounding on 31 August 2017 by Alice B. Clagett. IS THE CURRENT WEATHER LOW-HIGH CLASH AFFECTING HUMAN EMOTIONS … OR VICE VERSA? The Planetary K-index (Kp index) indicates how strong geomagnetic storms are. When the Kp index is high, spacecraft, electric power grids, and ham radio operators may be affected. –adapted from LInk: “Space Weather” … www.spaceweather.com .. Image: “Kp Index, 12 December 2015 12:30:02 UTC,” by NOAA/SWPC Boulder, CO USA, public domain … https://www.photolib.noaa.gov/about.html ..
Link: “Riding through the Winds of Change,” Hathors, Paros Island, Greece, copyright Tom Kenyon, 20 July 2008 … http://tomkenyon.com/winds-of-change ..
Link: “Chaotic Nodes,” Tom Kenyon and the Hathors, 27 April 2009 … http://tomkenyon.com/chaotic-nodes ..
Link: “Chaotic Nodes and Dimensional Attunement,” Tom Kenyon and the Hathors, 8 October 2009 … http://tomkenyon.com/chaotic-nodes-and-dimensional-attunements ..
Link: “Cognitive and Emotional Challenges during Chaotic Nodes,” A Hathor Planetary Message through Tom Kenyon, 24 October 2013 … http://tomkenyon.com/cognitive-and-emotional-challenges-during-chaotic-nodes ..
Link: “Earth’s Magnetic Field,” by Tom Kenyon and the Hathors, 2015, http://tomkenyon.com/earths-magnetic-field .. If you enjoy these blogs, you may wish to research the other, equally intriguing, Hathors Archives … Link: “Hathor Archives” at “Tom Kenyon” … http://tomkenyon.com/hathors-archives .. Image: “Weather Forecast for Saturday, 12 December 2015, issued 3:52 AM EST,” by DOC/NOAA/NWS/NCEP/Weather Prediction Center, prepared by Tate based on WPC, SPC and NHC forecasts, public domain … https://www.photolib.noaa.gov/about.html .. It is possible that this weather disturbance is causing the emotional turmoil I have been clair hearing since yesterday afternoon … or possibly vice versa. Citation: “The Astral Body and Other Astral Phenomena,” compiled by Arthur E. Powell, published 1927, Quest Book edition 1973, copyright The Theosophical Publishing House, London, Ltd. 1965, page 55. Various organizations are doing research on this today. See, for instance, HeartMath Institute’s research … https://www.heartmath.org/research/featured-research/ ..
Spaceweather observed that both Earth and comets can have geomagnetic storms. There is a space storm taking place right now for Comet Catalina (C/2013 US10). On 11 December 2015, Michael Jäger of Jauerling, Austria, took a picture of the comet showing blobs of plasma caused by this space storm. ‘Disconnect events’ or plasma blobs occur during CMEs and solar wind gusts. When space weather is very stormy, the tail of a comment might even be severed. Per Spaceweather, space storms are like geomagnetic storms on Earth, from the standpoint of physics. Comet ‘reconnects’ occur when a CME hits a comet that has opposite magnetic fields. The resulting magnetic energy burst causes the blobs and ruptures in the tail of the comet. When a CME strikes Earth, her magnetosphere fluctuates. The Northern Lights are the result of these fluctuations. The relationship of the EMFs of the human being, of Earth, and of the Sun are worth exploring, as these are intimately interactive. As we ‘bump up’ in Awareness … i.e., as we ‘gain Light Quotient’ during the Ascension process, we proceed from personal Awareness to Earth planetary Awareness to Solar System Awareness, to Galactic Awareness, to Awareness of this Universe and the Central Sun. An easy way to relate to these bump-ups in consciousness is to concentrate on our own human EMF (rather than on egoic inter-relationships or causality … such as ‘you did this to me‘ … which is what Matt Kahn … https://mattkahn.org/ …. and Christ, in the Bible … call ‘judgment’). Faith in ourselves, in God, and in the Universe … as Judy Satori … https://judysatori.com/ … says (to paraphrase) is a good way to get through the waves of Incoming Light. We can have faith, or appreciation, or gratitude. We are able replace our thoughts of blame and judgment and negativity with some positive emotion. All we have to do is turn our attention to our own selves, our own co-creative ability. As soon as this is accomplished, we relate to our own, personal electromagnetic field. Feel the bumps and waves and knots and tangles in it. These same are being experienced by Earth at this moment. Image: Artwork on the human EMF and Earth’s EMF, source possibly Pravda TV … http://www.pravda-tv.com/wp-content/uploads/2012/01/herzerde.jpg .. Imagine you are the Earth. Feel the Earth’s north pole and south pole. Feel the winds, the tides, the storms, the earthquakes. These are you. Then move on to our Solar System. Feel the Sun. Feel the planets circling round her. Feel how the light of Alcyone, our galaxy’s great Central Sun, (2) sails into her. How she carries the Light of God to all the planets and all their sentient … though non-physical … beings (3). Feel how she carries that Light to her beloved children on Earth. Then inhale deeply. Exhale deeply. And relax. For this artwork: The EMF of the Sun, and the EMFs of the planets circling round her. Image: “Magnetism and EMF: Excerpt from ICCC” … http://www.unariuswisdom.com/magnetism-emf-excerpt-from-iccc/ ..
For this artwork: “Alcyone, Sirius, and our Sun’s alignment”: See “Photon Belt: Fact or Fiction?” https://doowansnewsandevents.wordpress.com/2013/02/07/photon-belt/ ..
PS: HeartMath Institute has done research on Human-Earth Connectivity … https://www.heartmath.org/research/featured-research/ ..
Video: “Earthquakes and the Solar System,” by SuspiciousObservers, 6 January 2014 … https://www.youtube.com/watch?v=iHQm1KdvMnw&list=PLHSoxioQtwZcJiKVxaGLoL3cD2WBPby3z&index=8 .. Here are SuspiciousObservers’ playlists, in case tutorials are of interest … https://www.youtube.com/user/Suspicious0bservers/playlists ..
SuspiciousObservers (SO) lists incredible resources on their youtubes. You can find them by clicking ‘About’ beneath one of their videos. Here is their youtube home page … https://www.youtube.com/user/Suspicious0bservers ..
Alerts on Twitter: https://twitter.com/TheRealS0s ..
How to Use the App: https://youtu.be/ZhYjGQFMJ1M ..
Weatherman’s Guide to the Sun: http://stickmanonstone.com/product/weathermans-guide/ ..
Brown Carbon Forcing: http://www.nature.com/ngeo/journal/vaop/ncurrent/full/ngeo2960.html .. Dark Matter, Running Out of Options: https://www.pr.uni-freiburg.de/pm-en/2017/cast-project-places-new-limitations-on-dark-matter ..
South American Fault: http://www.las.illinois.edu/news/article/?id=22036&/news//news/2017/platetectonics17/ .. The Sun is Going to Sleep: https://www.youtube.com/watch?v=7whL9jvdL5s .. THE US WINDMAP: http://hint.fm/wind/ ..
Planetary Orbital Diagram – Ceres1 JPL: http://ssd.jpl.nasa.gov/sbdb.cgi?sstr=ceres;orb=1;cov=0;log=0;cad=0#orb ..
BARTOL Cosmic Rays: http://neutronm.bartol.udel.edu//spaceweather/welcome.html ..
GONG Magnetic Maps: http://gong.nso.edu/data/magmap/ondemand.html ..
(2) See Link: “The Great Central Sun,” at Ascension Research Center … http://www.ascension-research.org/gcs.html ..
Link: “The Law of One: The Ra Material” … http://www.lawofone.info .. This entry was posted in Anxiety - fear - panic attacks - fight or flight - cognitive dissonance - mental turmoil, Astrogeophysics - EMF - hologram, Comets - meteorites, Council of Nine - sentient beings of our solar system (see also 'Star brothers and sisters'), Desire, Hathors (see also 'All - Law of One - Ra'), Lower Mental Body - gut brain (see also 'desire elementals' and 'lower triangle' and 'vital body'), Lower triangle, Meditations - visualizations, Natural disasters - earthquakes - wildfires, Solar events - geostorms, War and peace - imprisonment and freedom and tagged 2u3d, Ascension, aurora borealis, auroras, CMEs, cognitive dissonance, Comet Catalina, comets, earth EMF, earthquakes, geomagnetic storms, gut brain, Hathors, human EMF, human emotions, human-earth connectivity, JScambio, Lower triangle, meditation, mental turmoil, solar events, South Pole, Tom Kenyon, Venus, visualizations on 12 December 2015 by Alice B. Clagett. WHAT IS THE IMPACT OF EARTH’S EMF ON OUR DAILY LIVES? The global geostorm index is known as the Kp-Index. This is based on the K-indices, which are quasi-logarithmic measurements taken every 3 hours. Baseline is a calm day curve at a specific location. –adapted from Link: “The Kp Index,” at Space Weather Live … http://www.spaceweatherlive.com/en/help/the-kp-index ..
Link: “Forget global warming, worry about the MAGNETOSPHERE: Earth’s magnetic field is collapsing and it could affect the climate and wipe out power grids,” by Ellie Zolfagharifard, 27 January 2014, at DailyMail.co.uk … http://www.dailymail.co.uk/sciencetech/article-2545465/Forget-global-warming-worry-MAGNETOSPHERE-Earths-magnetic-field-collapsing-affect-climate-wipe-power-grids.html .. The article implies that the Earth’s magnetosphere is collapsing. My own feeling is that it is constantly changing. Sometimes this feels dramatic, because humankind is beginning to sense the ever-changing shape of our own EMFs. For Earth, as for human beings, there are more bodies than the physical. There are also the subtle bodies of each of these, the electromagnetic field being but one such subtle body. These subtle bodies have been discovered through the clair abilities. They consist, in the main, of energies as yet undetectable by science, since instruments have not yet been developed to test these subtle energies … The electromagnetic field being one exception to this, as it can be scientifically measured, at least in certain ranges of Light. Looking round for common ground, amongst esoteric writings regarding these natural and human subtle bodies, I came up with the working hypothesis that the fluctuations of electromagnetic forces … both natural and personal … that I experience as a person who is EMF clair gifted, may correspond to the Buddhic Plane named in the Planes of Nature chart displayed above, and to the Causal Plane named in The Human Energy System image cited above. Image: “Buddhic/Christed Body,” by Steven Lumiere, at Energy Reality … https://energyreality.com/project/buddhic-christic-body/ .. In my own writings, I call the human electromagnetic field the Body of Light. Image: “Earth’s magnetic field,” ESA/ATG Medialab, released 22 November 2013 … http://www.esa.int/spaceinimages/Images/2013/11/Earth_s_magnetic_field .. Image: Earth’s Electromagnetic Field, at jonblackmon.com … http://www.jonblackmon.com/Earths_Electromagnetic_field.jpg .. Image: EMF of Earth above that of a human being, from etoileblue … https://etoileblue.files.wordpress.com/2012/02/heart-earth-fields_thumb.jpg?w=370&h=355 ..
Link: “Swarm (spacecraft),” in Wikipedia … https://en.wikipedia.org/wiki/Swarm_(spacecraft) ..
Link: “Swarm Reveals Earth’s Changing Magnetism,” by Swarm, 9 June 2014 … http://www.esa.int/Our_Activities/Observing_the_Earth/Swarm/Swarm_reveals_Earth_s_changing_magnetism ..
For me, a wholistic approach to Earth science would not indicate the use of the term ‘glancing blow’ in describing the impact of CMEs. 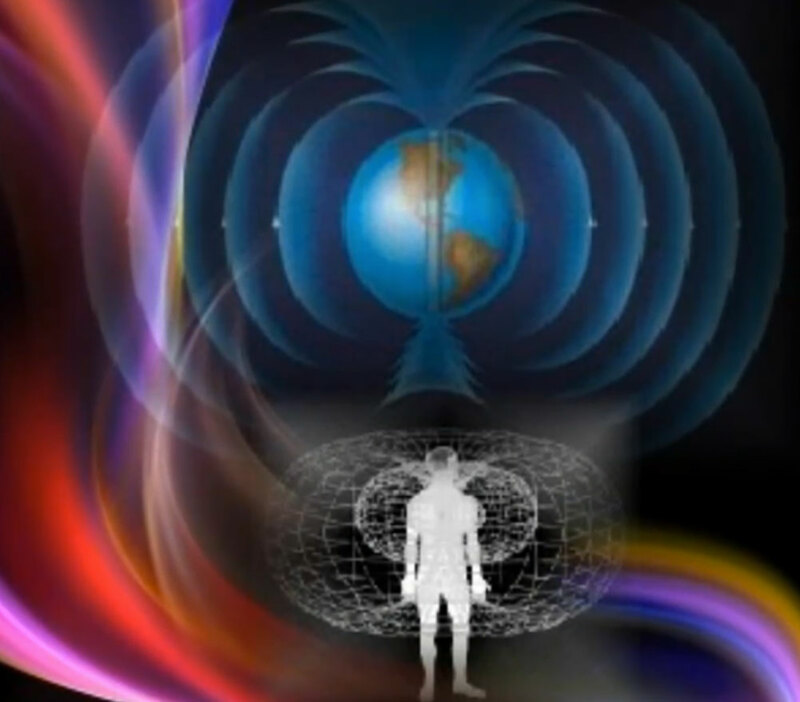 As with the human physical form, the physical form of Earth is permeated by Earth’s EMF. And so, when a CME hits Earth’s EMF, the ‘shock wave’ reverberates through the physical planet too … as well as through all of us humans, and all the animals and trees and plants. An important takeaway, from my own viewpoint, is that the EMF and physical oddities we feel during a CME do not indicate anything is ‘wrong’ with us. Earth is experiencing these same oddities, and we are just going along for the ride. When I began to understand this … what a child of Earth I am … in the most literal, ever-changing sense … I began to feel much more relaxed about my experience of sky events. It became ok to sense an energetic ‘shield’ on top of my head, for instance. This is just my own experience of the golden-blue shield above Earth’s EMF during a CME, as in the NASA image “Magnetosphere Rendition” (see above). In the same way, it became ok to sense a denseness in my head, maybe even a dull headache during a CME … You can imagine the golden-blue shield as causing a denseness in the ‘top’ … the Sun-facing portion … of Earth’s EMF during a CME as well. It also became ok to sense small fluctuations in my heart energy. These are like the shock waves coming into Earth’s core in the above-mentioned image. Then sometimes I feel a wobbling or wavering of the outer layer of my EMF. This wobbling or wavering is like the wobbling of the stylized EMF ‘apple’ shape off Earth, implied in that illustration. This entry was posted in 07 – Buddhic Body / Christed Body / Body of Light (5D), Ascension symptoms, Astrogeophysics - EMF - hologram, Solar events - geostorms, Yoga, ZZ- Awakening with Planet Earth and tagged astrogeophysics, CMEs, coronal mass ejections, Earth's EMF, electromagnetic field, emf, human EMF, solar events, subtle bodies, subtle energies on 11 November 2015 by Alice B. Clagett.